I received a copy of The Little Mermaid Legacy Collection CD as a member of the Entertainment New Media Network. No further compensation was received and all opinions are my own. This post may also contain affiliate links. 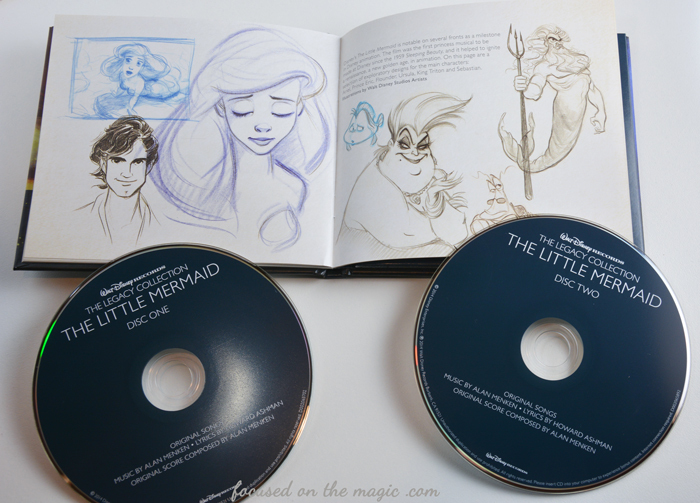 The Little Mermaid movie is one of my favorite animated movies and I was so pleased to be given the opportunity to review and host a giveaway of Walt Disney Records The Legacy Collection The Little Mermaid 2-disc CD set. It's truly hard to believe that it's been 25 years since the movie's release. I remember my sons seeing it for the first time and the absolute joy on his faces as he watched it. My oldest son's favorite character was Sebastian and my youngest son's was Ursula. The music and story was captivating. We quickly learned the lyrics to the songs and sang along whenever it was playing and we played it a lot. So, when I received The Little Mermaid collection featuring the songs and score from the film by Oscar®-winning composer Alan Menken and lyricist Howard Ashman and popped it in and cranked it up the room immediately filled with happy memories. I then brought it out to the car because our car acoustics are the best and I wanted to have the music surround me. The sound quality on the CD's has been brought up to date with the latest technology. It sounded fantastic! The full orchestration is amazing! My son and I drove to the store humming along to the familiar tunes and reminiscing about his growing up listening to this wonderful music. When we got to the store we had to sit there listening for awhile soaking it all in. We couldn't sit through both CD's because it was 27 degrees (17 wind chill) outside. We're in New Jersey. My son and I made new memories to treasure while enjoying the rest of the 2-disc set later over hot cocoa and cookies. I enjoyed reading the 20 page booklet with personal stories and the beautiful newly created artwork inspired by The Little Mermaid from Lorelay Bove. Disc Two has twelve work tapes and song demos performed by Alan Menken and Howard Ashman. Also included are liner notes by Alan Menken, John Musker (Co-writer, Director and Producer, “The Little Mermaid”), and Chris Montan (President of Walt Disney Music). A timeless treasure! 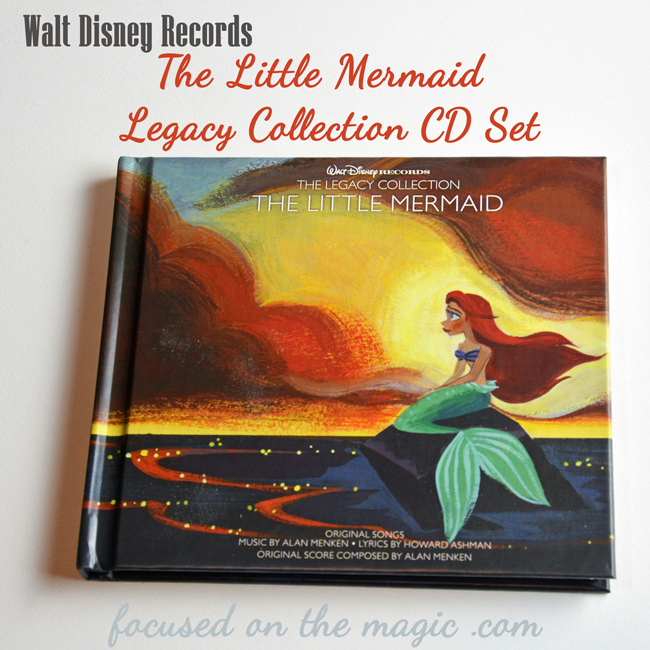 The Little Mermaid Legacy Collection CD Set would make a perfect gift and great addition to any Disney fan's music library. The Disney Music Legacy Collections are growing too with The Legacy Collection Fantasia set for release on January 13, 2015 and the newest Into The Woods collectible offering available that includes the Deluxe Edition soundtrack featuring 20 songs and score with music and lyrics by Stephen Sondheim, plus 10 character art prints from the film. Walt Disney Records’ newly launched site, Disney Music Emporium (DME), is a destination for collectible Disney music products that also features monthly columns by guest writers, a News tab for fun Disney facts, plus videos that exclusively debut on DME including behind-the-scenes of beloved soundtracks, The Lost Chords and more. For more information on Disney Music Emporium, please visit, DisneyMusicEmporium.com become a fan at Facebook.com/disneymusicemporium or follow us at Twitter.com/DisneyMusicEmp. Now it's time for The Little Mermaid 2-disc CD Set Giveaway! 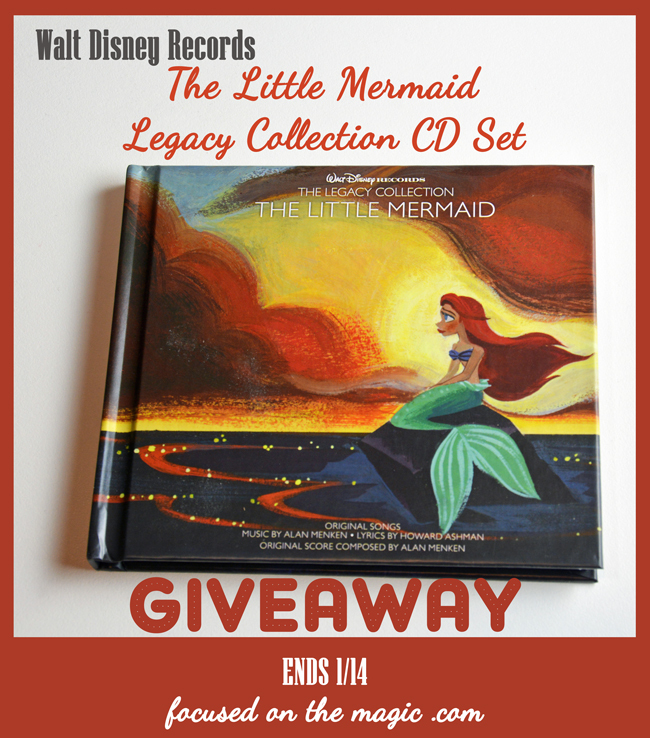 One lucky Focused on the Magic readers will win a Walt Disney Records The Legacy Collection The Little Mermaid 2-disc CD set. Prizes will be fulfilled by and sent directly to the winners from Walt Disney Records. Please allow 6-8 weeks for shipping. The giveaway will run from now until 1/14/2015 Midnight EST. The winners will be announced on the Focused on the Magic Giveaway page, after the winner s have accepted their prizes.